Thinking of buying or adopting a Siberian Husky? The Siberian Husky is a medium-sized spitz-type breed with well-balanced proportions that belongs to the working-type sled-dogs. It has a finely chiselled fox-like appearance and shares many physical similarities with the Alaskan Malamute and the Samoyed including a medium-length muzzle that is slightly rounded that tapers gradually to a rounded nose which can be black, liver or flesh-coloured, depending on the colour of the coat. It has almond-shaped eyes that come in any shade of blue or brown, either colour for each eye or parti-colours that impart a keen but friendly expression. The triangular ears of the Siberian Husky are highly set and carried erect with thick furs both in and outside the ears. A well pigmented lips and teeth that forms a complete scissor bite completes the facial features. The neck is of medium length and thickness and in proportion to the rest of the body which carries the head proudly. The forelegs are straight and moderately spaced with proportionate bones while the hindlegs features well muscled thighs, enabling the dog to efficiently carry the broad-chested body. The Siberian Husky has tougher and thickier pads on the feet than any other dogs which help the breed traverse icy paths without freezing. It also has a distinctive well-furred, fox brush shape tail similar to most northern breeds. 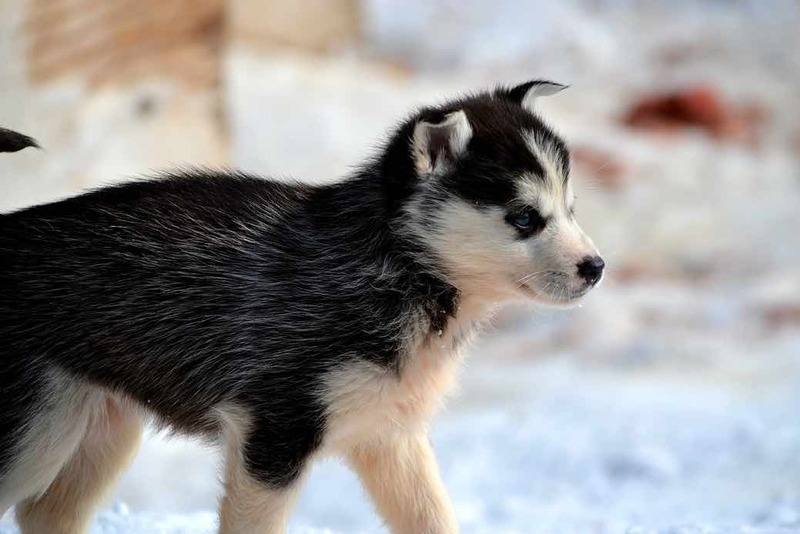 The Siberian husky has a thicker coat compared to other breeds of canine which comes in a multitude of colours and patterns but usually with white paws and legs, facial markings and tail tip. The double coat is made of straight and smooth-lying outer coat with soft and dense undercoat which comes in all colours including pure white. The Siberian Husky is believed to be one of the oldest dog breeds, as evidenced by recent DNA analysis (Science, Volume 304, May 21, 2004.) that originated from the Siberian Peninsula. It was developed by the Chukchi people for sled-pulling and reindeer-herding over three millennia ago during their expansion. 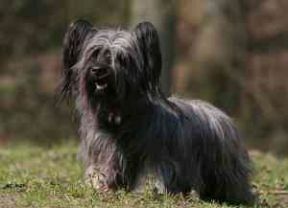 This northern breed has an uncertain lineage but based on its appearance, it is most certainly of spitz-type origin. The Siberian Husky was made famous from 1908 during the gold rush as a faster and more enduring sled dog. In 1909, it garnered further recognition when the breed was entered in the extremely popular All-Alaska Sweepstakes (AAS) race which covered 408 miles between Nome and Candle, Alaska. 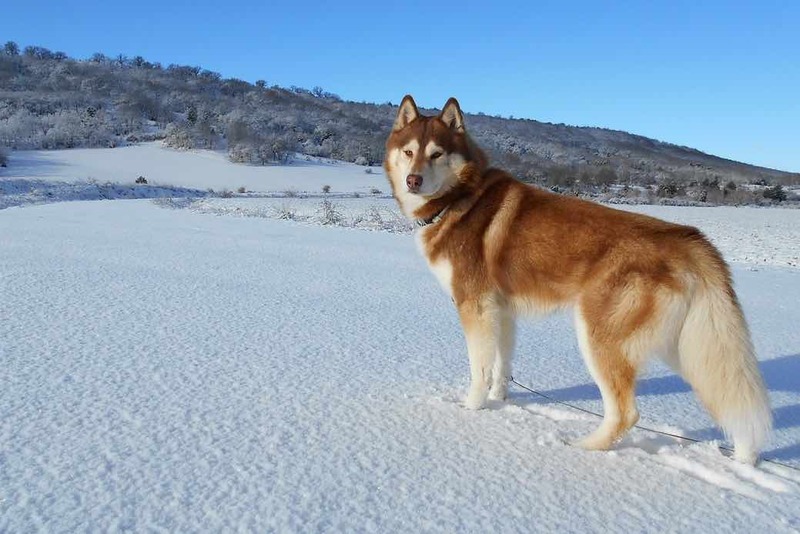 The following year, Siberian Huskies bred and raised by Charles Fox Maule were entered in three teams which dominated the annual race winning first, second and fourth places. Similarly, the Siberian Huskies bred and trained by Leonhard Seppala, a Norwegian fisherman turned gold miner, dominated the races thereafter. In 1925, these dogs became key figures in the 340-mile long serum run to Nome, Alaska which delivered antibiotic for diphtheria by dogsled to the stricken town. In honour of their gallantry and bravery, the town of Nome erected a statue in Central Park to honour the breed. 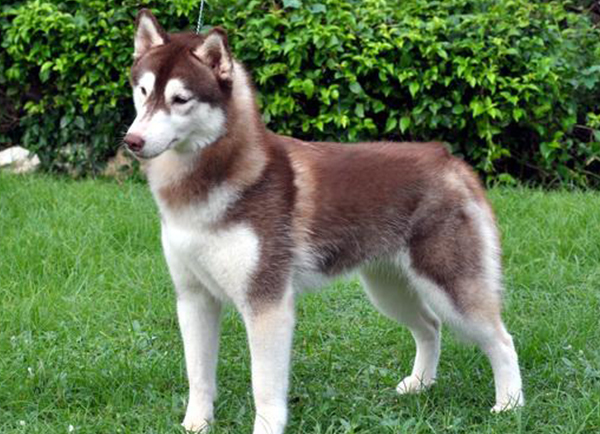 Today, the Siberian Husky is a popular companion dog as well as a sled-, cart- and race dog. The Siberian Husky is an intelligent and highly trainable breed. However, it can be independent and may obey a command at its own will. 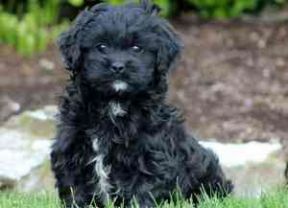 It barks very little and lacks the suspicious character towards strangers which makes it a poor watchdog. It has a bad habit of howling, digging and chewing, but with early socialization, these can be prevented. Sometimes having a stubborn streak and its natural independent character requires patient and consistent training from an understanding handler. Socialization at an early age with other household pets especially cats and other small animals, is recommended. Constant human attention must be given to prevent boredom from setting in which may manifest into excessive digging and chewing or even howling. This breed can not tolerate warm weather because of its thick, heavy coat and should not be subjected to vigorous exercises when the climate is hot. Grooming is moderate; just twice a week of brushing is sufficient, although more frequent attention is required during the twice a year shedding season. The Siberian Husky is not recommended for an apartment life and will do best in a house with a large, well-fenced in yard. The Siberian Husky is a healthy breed with an average lifespan between thirteen to sixteen years of age. Health issues that are known to affect the breed include eye problems (cataracts, glaucoma, and corneal dystrophy among others), allergies, and cancer in older lines. 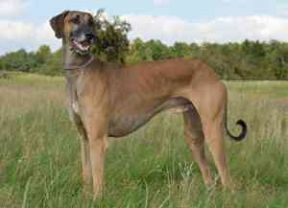 Hip dysplasia rarely occurs but is not a major concern in the breed. The coat and nails tend to become brittle if the breed lacks the right amount of fish oil in its diet. The breed’s diet should always be high in fat and protein which can come from fish and poultry (similar to the diet from its native origin including salmon and other fresh water fish.) This breed consumes less food than other dogs of the same size and activity level. Feeding should be based on the dog’s size and activity level to prevent obesity. This highly energetic breed must be exercised on a daily basis. 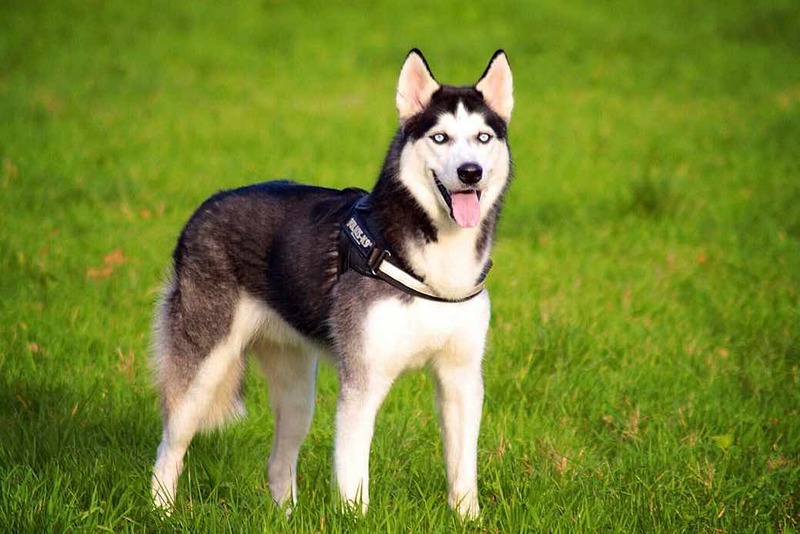 Activities which can provide physical and mental stimulation such as a good run (typically in cold, snowy climate), sled pulling, or a session of play in a well-fenced in yard are ideal activities that can provide the amount of exercise that the Siberian Husky needs. It is highly energetic and playful and good with children. As a dog that worked in packs, it is typically friendly towards strangers and excellent with other dogs, though it may chase down cats or other animals that are unfamiliar with it.